Antoine Arena, like most Corsicans of his generation, grew up in a family that earned a modest living working the land on an island largely unknown to the outside world. As soon as he could he joined the mass exodus of Corsicans to the French mainland, in search of jobs and what they thought to be a better life. Several years later, in the mid-1970s, with a promising career on the mainland, the Corsican independence movement exploded with violent confrontations between nationalists and French government forces, leaving Antoine stunned. I became a farmer by protest. In his shock and anger, he moved back to the family farm and decided to reverse the trend and remain on the land, as his own form of protest. Many others soon followed his lead, and for the first time in over a century, the emigration from the island ebbed and Corsicans came back home to reclaim their land. “I became a farmer by protest,” he says. 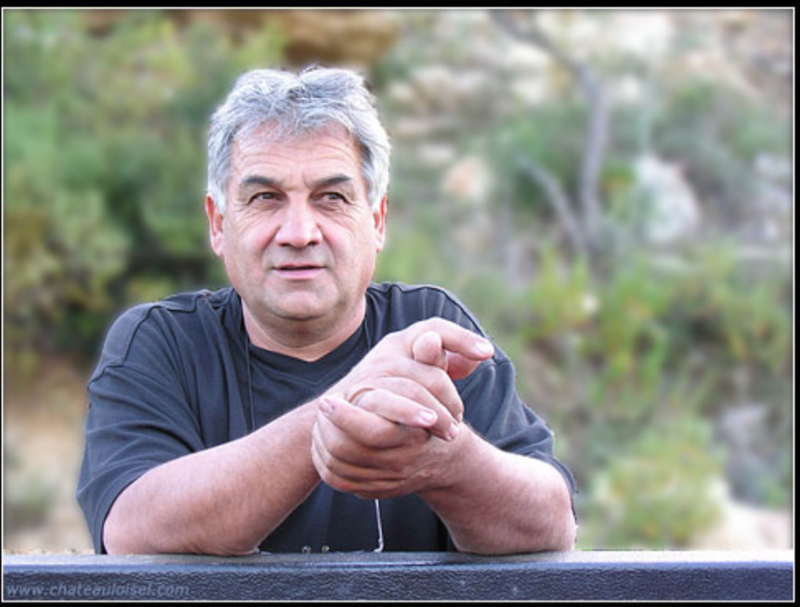 It might originally have been political activism that drew him from a law career into agriculture, but Arena was soon passionate about turning his father’s 3-ha domaine into one of the island’s leading vineyards. Biodynamics, it seems, come naturally to him, with his dislike for large agrochemical companies equal to his strong attachment to his island. “There’s a sign I remember seeing in the 1980s,” he says: “Jettez les pelles, et mettez l’herbicide.” This translates roughly as “Throw away your shovels, and put down weed killer.” The Arenas use just 800 grams of sulphur per hectare to treat their vines for powdery mildew according to Jean-Baptiste, Antoine’s son. That’s just a fraction, he explains, of the four kilos per hectare that the biodynamic regulations permit. To survive off the land, Antoine knew he would need to show the world outside of Corsica what Patrimonio was capable of. And so his mission began to make the best out of the land; he started identifying the best parcels and vinifying them separately, and was one of the first growers to work the vines organically and vinify without any added sulphur. Now Antoine is joined by his two sons, Antoine-Marie and Jean-Baptiste who share Antoine’s spirit and continue to work the land and make the wine naturally, as taught from their father. The Carco vineyard is on an eastern facing slope, cleared of its maquis and planted in 1987 by Antoine. The name of the parcel, Carco, dates back to at least Napoleonic times, and in Corsican means “busy,” most likely due to the fact that it was covered in densely planted olive trees at that time, before being abandoned. 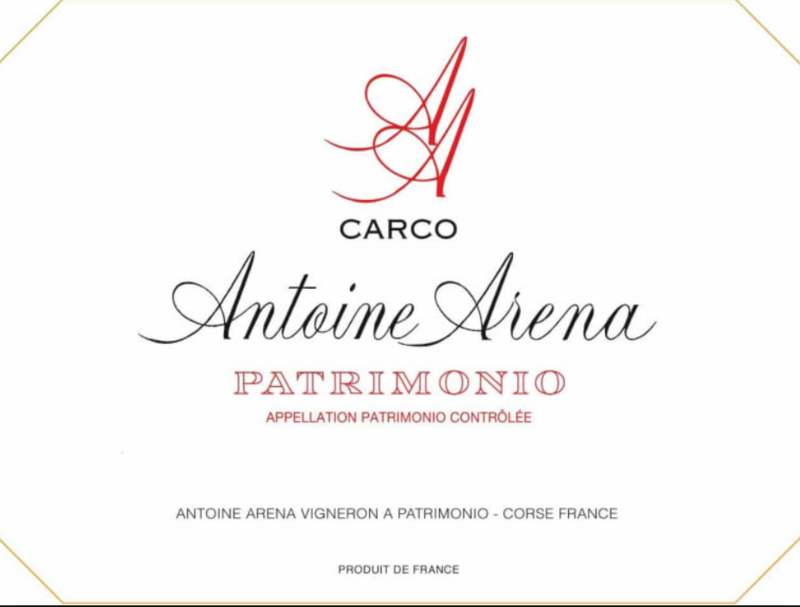 Two different wines come from this vineyard: the Patrimonio Carco Rouge, from Niellucciu (1ha) and the Patrimonio Carco Blanc (2ha), 100% Vermentinu. (Vermentinu arrived in Patrimonio well before Niellucciu, although the date of its arrival is still unclear). Think heat, think rocks, think garrigue and add citrus refreshment. From low-yielding hand-harvested vines this Vermentinu is fermented naturally with low sulphur in cement cuves and spends a long time (6-8 months) on the fine lees. It completes its malo naturally and then is bottled without filtration or fining. The colour is straw and clear with a shimmer of trapped gas. Aromas of salted roasted nuts give some indication of the extreme ripeness of the wine, stone/mineral, plump, sweet fruit flavour in the vicinity of green bananas and mushy ripe pears. Throw in some preserved lemons and oranges, maybe a little mint. These are punctuated with fennel and sweet herb flavours. Think heat, think rocks, think garrigue and add citrus refreshment. The Morta Maio vineyard was planted in 2001 with only Niellucciu. 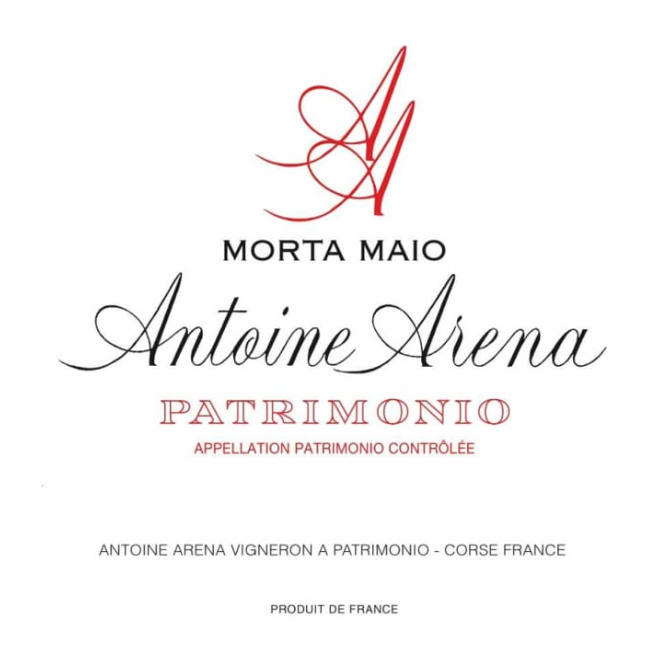 There is just a single cuvée from this parcel, the Patrimonio “Morta Maio” Rouge. This is often the most approachable of the reds when young—dark, earthy, chewy and juicy. Morta Maio translates as “The Eldest Myrtle”, Morta meaning myrtle in Corsican, the shrub that makes up the bulk of the maquis in Patrimonio. (In other parts of Corsica they spell Morta as Murtha, where you can see more of the resemblance to the word Myrtle). Maio means The Eldest, or the oldest. This parcel, which has belonged to the Arena family for over 400 years, immediately surrounds their house and was used as brush pasture for the donkeys who worked the vines. Since the parcel has been in use for so long (longer than the 400 years it has belonged to the Arenas) the term “Maio” was added to it. Niellucciu is Sangiovese with a Corsican rustic twist. This Niellucciu is also fermented in cement cuve with its own yeasts and without temperature control, and is aged for a further period in concrete before bottling without filtering or fining. Niellucciu is Sangiovese with a Corsican rustic twist. vividly fresh, infectiously juicy ripe cherry mingled on a satiny palate with nut oils and steeped with fruit pit, lavender, fennel, rosemary, and white pepper. As this opens to the air, a mouth-watering savour of roasted red meat and pan scrapings joins the wine’s downright refreshing as well as invigorating juicy fruit and pungent herbal essences.